During heavy snowstorms, even veteran truck drivers can end up in a ditch. 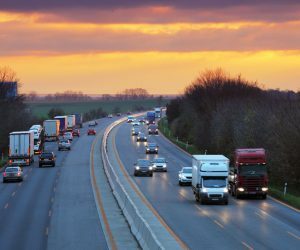 However, accidents are not the only way drivers can become stranded. Using the wrong fuel blend, failing to maintain engine components and blower systems, and ignoring the outside of your truck can all contribute to roadside delays. 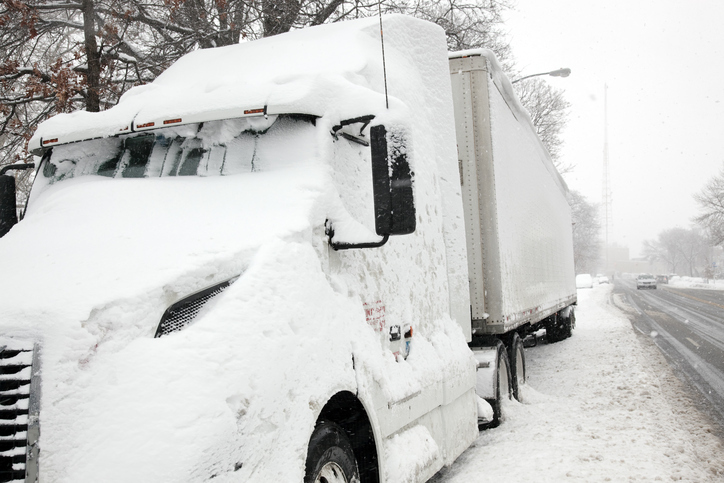 Use these winter trucking safety tips to keep your truck and trailer in top condition. Using the correct fuel blend may be the most important part of winterizing your engine. Diesel fuel contains a certain percentage of paraffin, a waxy by product of petroleum distillation. It is this wax that congeals in colder temperatures, causing the fuel to gel. The gummy fuel can cause issues with truck operation or even result in engine failure. During warmer seasons, most gas stations carry a 2D blend of diesel fuel with a higher heat value than cold weather blends. As winter approaches, fueling centers switch to a winter blend of 1D and 2D diesel. The blended fuel is not as energy efficient, but it is also less likely to gum up your engine in freezing conditions. Another thing to consider is the cetane number. This number indicates how quickly the fuel combusts, which determines how long it takes to start your engine. The higher the cetane number, the faster your truck will start. You can find both fuel grade and cetane information listed on the truck stop pump. Diesel engines require higher cylinder temperatures to start than their four-wheeled counterparts. In other words, you may need additional heat to get your engine started, especially if you live or work in cold climates. An electric block heater can keep your engine warm overnight, making it easier to start in early morning temperatures. Make sure the block heater is well secured, so it will not be jostled loose by engine vibrations or rough road conditions. Routinely check the intake pre-heaters for proper operation. If the unit has glow plugs, make sure they are working correctly as well. Finally, give your engine about 10 minutes to warm up when you first start it to ensure it is at the optimal operating temperature. Water in your fuel can wreak havoc on your truck engine injectors and fuel pumps. These components are time-consuming and expensive to replace. Fuel contamination risks are higher in the winter because rapidly cooling fuel inside a warm tank creates condensation. Temperature fluctuations and humidity levels affect the amount of condensation that appears. There are a couple of things you can do to reduce water contamination in the fuel lines. First, fill your tank at the end of the day. This reduces the amount of condensation that forms overnight. Second, consider installing a water separator if you do not have one. The unit collects tank condensation and stores it separately from the fuel. However, you must check and drain it daily to prevent freezing and the resulting engine performance issues. Maintaining your coolant systems, air dryer, and battery are also important parts of keeping your rig in top operating condition. These systems affect your vehicle’s ability to operate safely. Use the following checklists to make sure your truck is ready for winter. The cooling system keeps your engine from overheating while it is in use. It is also responsible for keeping your cab warm. In cold weather, high-powered diesel engines place even more of a demand on coolants. Follow these steps to make sure your cooling system is working properly. Schedule regular preventative maintenance to uncover hidden issues like faulty cab heaters, clogged hoses, or radiator leaks. Check belts and hoses for signs of wear, including cracks, brittle rubber, or bulges. Winter weather is harder on these components, and parts failure can result in engine damage. Maintain coolant levels and additives on a regular basis. Just like fuel, coolant also has summer and winter formulations. For example, most engines take a 50/50 mix of water and antifreeze during warmer months. In the winter, you may need to reduce or eliminate water in your coolant mix. Your owner’s manual will have recommended coolant levels and makeup information. While you are topping up coolant levels, check the oil too. A well-lubricated engine runs smoothly and is less likely to overheat. Big rigs use an air braking system to slow heavy loads. If contaminants enter the system, it can cause brake failure. The air dryer sits between the compressor and the wet tank. It filters the air brakes, removing solid, liquid, and vapor contaminants before they can enter the braking system. In wintry conditions, water can freeze in the valves, preventing your brakes from working properly. 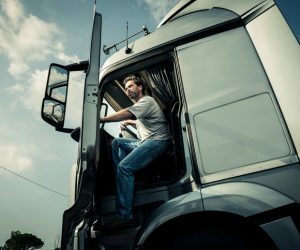 With 40-plus tons of semi and trailer hurtling down the highway at 65 miles an hour, brake failure can be deadly for truckers and four-wheelers. Change the air dryer filter just before the season starts to keep your air dryer operating properly. The air dryer should also be a part of routine maintenance checks during the season. Just like smaller engines, diesel engines require enough battery power to crank the engine, so it will start. Cold temperatures are hard on batteries; freezing weather drains them faster. Most batteries have a 48- to 72-month lifespan. Go ahead and replace batteries that are a few months away from the end of their life cycle rather than risking a stall out or breakdown. If your battery is not old, perform a load test on it and replace it if necessary. For good batteries, ensure they are securely mounted. The terminal connections should also be tight and clean. This is also an opportune time to inspect other electrical components. Make sure the starter and alternator are functioning properly. Check wiring also; replace cracked or frayed wires. Secure any loose, hanging, or exposed wires to prevent ice and snow build-up. Blowouts can be dangerous under optimal conditions; on icy roads they can be fatal. In addition to internal maintenance, it is also important to make sure your tires are safe for use. First, check tread depth and wear before each trip. Make sure tires are inflated to the proper pressure as well. Over- or under-inflated tires are more damage prone and wear out faster. Keeping an eye on tire pressure is not just safe, it also saves you money. Second, if you carry tire chains, make sure you know how to use them. Twisted chains can break loose and damage tires or other vehicles on the road. You should also ensure you have the correct number of chains for your vehicle and trailer. The tires are not the only exterior systems to check. For example, it is a good idea to check your exhaust pipe for blockages, especially after a heavy snowfall. Replacing your wiper blades before winter hits can give you better visibility in sleet and snow. Switching to a wiper fluid that contains de-icer is also helpful. 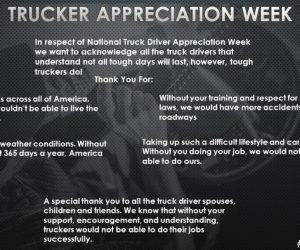 Even veteran truckers with finely tuned rigs still experience unexpected conditions. Be prepared for any eventuality by creating a roadside emergency kit. Here are a few ideas for your emergency supplies. Pack non-perishable food items. If it is canned food, make sure you have a can opener on hand as well. Choose food you can eat with little to no preparation. Keep an extra package of bottled water on hand. You will want measured portions you can ration if necessary. Build a first aid kit, including Band-Aids, gauze, disinfectant, burn cream, and other medical supplies. Blankets, scarves, long underwear, boots, gloves, and other cold weather gear are vital as well. They can help you conserve precious body heat in a cold cab. Bring flares and an extra radio to help you flag down help or warn other drivers and motorists of dangerous road conditions. Keep extra engine coolant, oil, and washer fluid on hand. If problems arise during a trip, you will be prepared to get back on the road. Proper diesel maintenance goes a long way toward keeping your vehicle operational. Do a pre-trip inspection on a regular basis to prevent future problems. Finally, stocking your truck with emergency supplies can help you stay safe until help arrives after an accident.